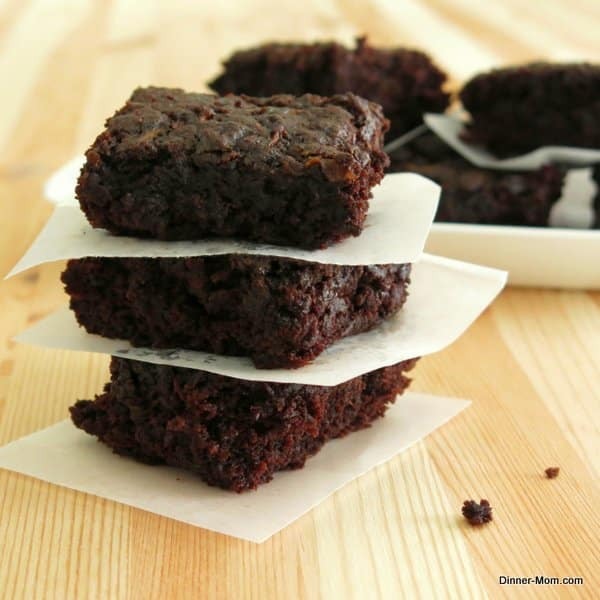 Chocolate Zucchini Brownies have a vegetable hiding inside, but you’d never know it! 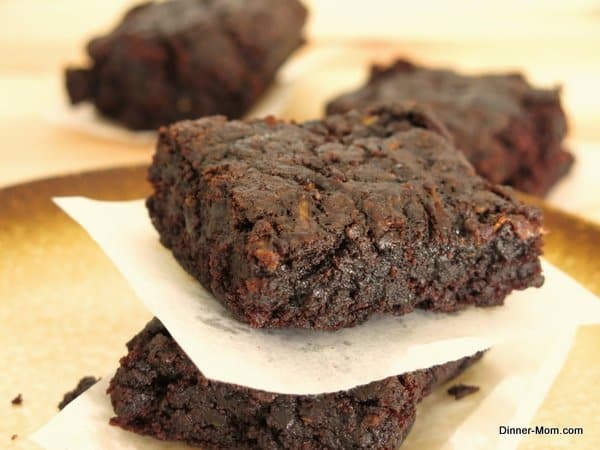 This recipe is naturally vegan, fudgy, healthy and delicious. They’re moist and have a rich chocolate taste! We love the magic of zucchini shreds so much in this recipe that we used them in Death by Chocolate Zucchini Muffins and Healthy Zucchini Muffins too. In case it’s not obvious from posts on zucchini noodle alfredo or zucchini chips from the microwave, we’re a little obsessed with this vegetable. It can do just about anything! National Zucchini Day, happens to be on August 8th, but don’t wait to try these! 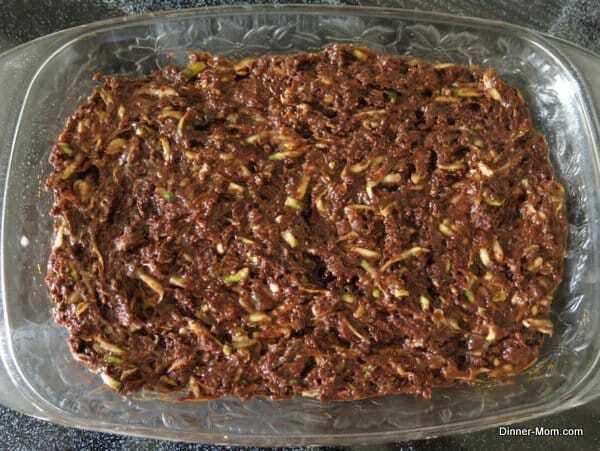 Making these brownies isn’t much different than making a traditional one, except that zucchini shreds are added and the result is a very moist and delicious treat! There’s a video recap just before the recipe instructions. Bowl 1: Mix together sugar, canola oil and vanilla extract until well-combined and crumbly. We used a combination of sugar and a stevia blend in order to keep with the healthy theme of this brownie. We’ve also used olive oil instead of canola oil. It works! Bowl 2: Combine flour, cocoa powder, baking soda and salt. 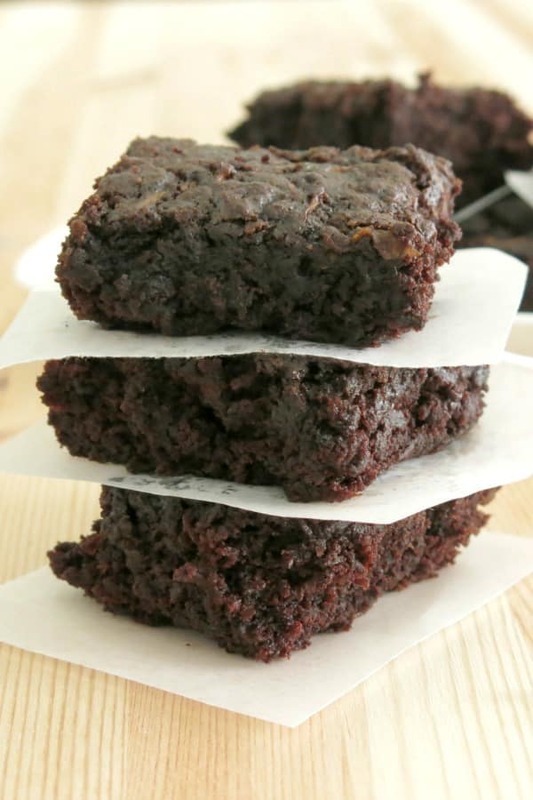 We used unbleached all-purpose flour to make the zucchini brownies pictured. We use whole wheat pastry flour these days. Combine: Stir the sugar mixture into the flour mixture. 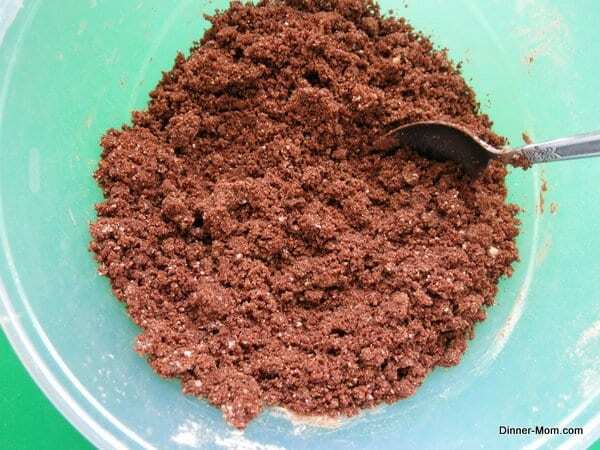 It will have a crumbly texture as shown in the picture below. It won’t feel like regular brownie batter at this point. In case you’re wondering, one bowl can be used instead of two. We find that the ingredients are more evenly distributed when we do it this way. 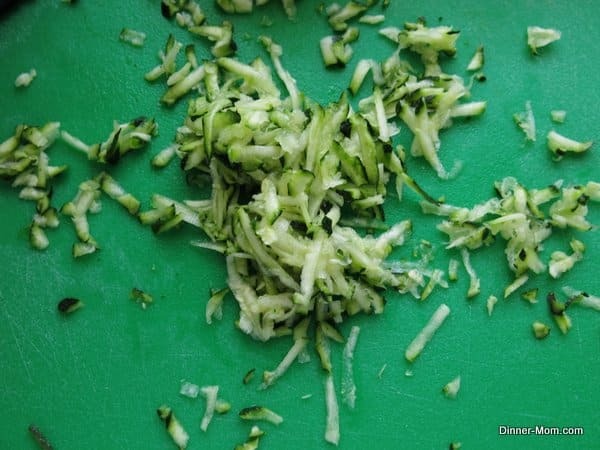 Grate a zucchini, skin and all, until you have two cups of shreds. We used one pretty large zucchini and had some leftover. If this happens to you, make Zucchini Egg Muffins or Zucchini Fritters with Feta! Unlike other recipes, a little moisture is a good thing. There’s no need to press out extra wetness. Usually. Use a large-holed grater for the best results. If a small-holed grater is used, you might need to because you’ll end up with more water. What should the batter look like? It’s an important question so we are pausing to talk about it and view a picture! The batter will be thick. Fold the zucchini into the flour and sugar mixture and stir until distributed throughout. The batter becomes wetter as the zucchini shreds are incorporated. So, stir well. If for some reason the batter is just too thick, then add a teaspoon of water. Scrape it into a baking dish. Have faith. A magical process occurs during the cooking process transforming the final product to a moist and chewy brownie. These chocolate zucchini brownies are the real deal. They are vegan, healthy and delicious. And, you can’t taste the zucchini, despite what one of my darling daughters might tell you! There’s no better way to eat your veggies than with these chocolate zucchini brownies. 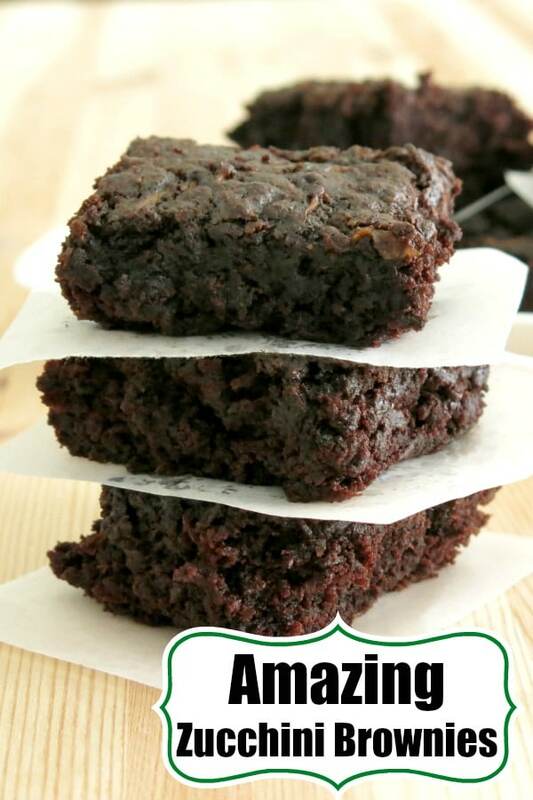 Chocolate Zucchini Brownies are amazing! 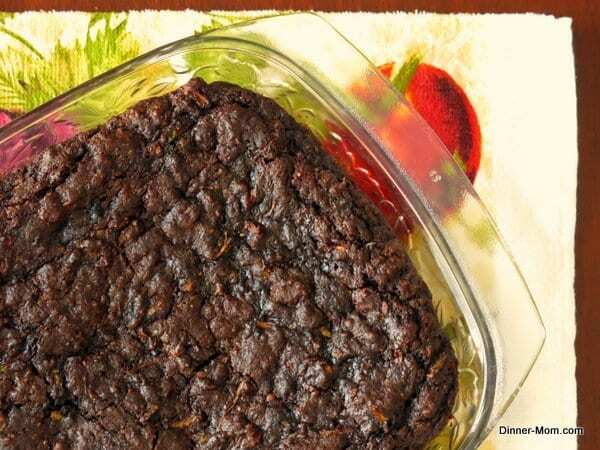 This naturally vegan recipe is fudgy, healthy and delicious. You'll never know there's a vegetable hiding inside. Thoroughly combine oil, sugar and vanilla extract in a bowl. Combine sugar mixture and flour mixture. The batter is crumbly. Grate zucchini and measure 2 cups of shreds. Stir zucchini shreds into batter until thoroughly incorporated. Batter should be moist and thick. Allow brownies to cool before enjoying. Variations: Add 1/2 cup chopped nuts or chocolate chips. This recipe was adapted from a recipe found on AllRecipes. Deeelicious , yet nutritious, moist mouthful of heaven! Are there any nutrition facts/calorie info for this? Just curious. Hi! Unfortunately I don’t have any nutritional information. But, using a stevia blend reduces the amount of refined sugar…and it does have zucchini in it! Thanks for reading. I just did the nutritional info on these in MyFitness Pal. 222 calories based on 16 servings. 7.8 fat, 35.8 carbs, 3.8 protein. Someone else commented you could change half out of the oil for unsweetened applesauce and half the flour with whole wheat flour too. That could help reduce calories too! Can’t wait to try these! Thanks! I just made these and they are sooooo good!! These are great. I made them healthier by replacing half the oil with applesauce, half the flour with whole wheat flour and half the sugar with Splenda for baking. Thanks for sharing the healthy tips! Hello, i really want to try this recipe, will it make a big difference if i use bleached flour as opposed to un-bleached flour? Hi! It should work out fine with all purpose flour too. There were really yummy. Just go done making them with my boys. They are pretty picky, but gave them a definite thumbs up! “Mom you can’t even taste the zucchini!” was what I kept hearing. Thanks for sharing. I’m so glad everyone liked them! Has anyone tried feeding the finished results? I was wondering if I could make a few batches, freeze, and enjoy later. I have not tried freezing these…but, I think it’s definitely worth a try! These were delicious! I would never know they were vegan I was suprised the texture was perfect, and would never know they have zucchini in them! I followed the recipe pretty much exact (I used veggie oil instead of canola). Next time I might try whole wheat flour and coconut oil and add some type of nuts. Thanks for your feedback. Love your ideas for making them even healthier! Brava ! I hate most veggies and of course that’s all I’m _supposed_ to eat. Could I grate the zuke and add it to soup or into a spaghetti tomato sauce to have with pasta? Also what spices go with zukes’,please? Thanks for stopping by! Grated zucchini is awesome in soup and can act like pasta too! As for spices, it depends what you are using it for. If you are using it in spaghetti, a little oregano might be nice. But, I usually just sprinkle with a little salt and pepper. I love zucchini with basil. I sliced some really thin the other night and put them on homemade pizza. You can cut them in half lengthwise and scoop them out a little (just the seeds) then fill with meat, sauce and cheese then bake. There are a ton of recipes online for zucchini. I used a bunch the other day with a jar of last year’s apple butter to make a bread. Good luck and have fun experimenting! Sounds like a delicious way to enjoy zucchini! Thanks so much for your comments! You should be able to replace the flour with a gluten-free type, such as the one Bob’s Red Mill makes. Thanks for your question! I hope that helps. Thanks for sharing. I made these last night in celebration of surviving day 20 of a 22 day Vegan Challenge! I cut back on the sugar and oil a bit and they were very tasty. I will make these again and again. Congrats on your challenge! Thanks for your comment. 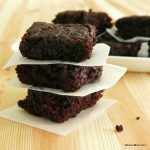 These are my new favorite vegan brownie recipe! Thank you! I made these today – I used 1/4 cup coconut oil & 1/4 cup applesauce in place of the canola oil & I had to add a few Tablespoons of almond milk (because I think I squeezed out too much liquid from my zucchini), but they turned out really moist & delicious. Mine were more cake-like (probably because of the applesauce), so I added a simple glaze of powdered sugar, vanilla, milk, & a tad of butter. So good! My husband & kids didn’t even notice the zucchini. I will be keeping this recipe & making these again! Thanks! Did you squezzee your zuchinni? Hi! Blot dry, but you don’t need to squeeze it dry. Thanks for your question and I hope you enjoyed them! Omg!!!! I don’t need to search another recipe for chewy brownies!!! This is it! I was a bit skeptical because the batter was too crumbly looking texture but I didn’t need to worry about that at all!! It came out perfect chewy inside and crunch outside brownies!!! Thank you for sharing!!!! thanks for your comment. I think I was skeptical the first time I used zucchini in a dessert…but, now it is my favorite brownie! These were so good! My whole family loved them. I did make some changes. I added applesauce instead of oil, 1/4 cup flax seed with the flour, 3/4 cup cocoa since I like extra chocolate, 1/2 cup chocolate chips, 1 egg since I have chickens and needed to use them, and 1 cup rhubarb since I have an abundance of that too. They were chocolaty with bites of tart rhubarb. Didn’t even know the squash was there. They were more cake like than brownie like but delicious. Wow! Love your version. Thanks for sharing! Great recipe! Will definitely make it again! Thanks for sharing! Not sure why I didn’t have as great a success as the other people here. Once I had all of my ingredients mixed together (zucchini included) it wasn’t nearly as thick & moist. It would ball up if you pushed it together, very crumbly like step 1. I thought maybe I had missed an ingredient or mixed up a measurement but I didn’t find any. I ended up adding a bit more oil and zucchini to get a little more moisture but it didn’t seem to help. I’m a novice baker so I figured I’d trust the recipe and throw it in the oven. It did come out nicely but not like a brownie, more cake-like. It also isn’t nearly as sweet as if I had used regular sugar (instead of the modified stevia amount). Still pretty tasty when all is said and done (definitely can’t tell there’s zucchini in it! ); I was just wondering if anyone had any feedback that might lead me in the right direction! I LOVE these brownies! They always seem to take a bit longer than posted to bake for me, but I love I them! I typically add less sugar and add raw honey to sweeten. I like the idea of doing applesauce in place of some oil too! One question, how should they be stored? Fridge or counter? Thanks so much for comments. Love your substitutions. I store them in refrigerator…when I have any leftover! So glad I found this recipe, it’s genius! Just made it and the brownies are seriously delicious. A big thanks and greetings from Germany! I am thrilled that you found me all the way from Germany and that you liked the recipe! Cheers! Yummy…eventually! After mixing all the ingredients, my ‘batter’ was super dry it wouldn’t even come together. I did not squeeze out any moisture from the zucchini. Maybe if I let it sit for a while the zucchini would have moistened the batter? SO, I added about 1/4 cup of applesauce (actually one squeezable unsweetened applesauce pouch), and that was the perfect addition to make my mix an actual batter. I was a bit worried I would feel/taste the zucchini as there was a lot in the batter, but the end result was a super moist brownie that my 3 and 7 year old (and I) devoured!! My husband thought it was a bit too moist, but he didn’t let it cool before he ate the first piece. I’m keeping recipe to definitely make again!! Thank you!! I’ve made these twice and they don’t cook either time. I even left them in 10 extra minutes and it’s completely raw. It must need a higher temp or significantly longer cook time. I’m so sorry. Could the zucchini still have a lot of liquid in then shreds? i added an avacado and it was yummy! These were so yummy. Moist and chocolately, plus I even had veggies! A win-win for all eaters. I brought these to a party and everyone raved. I didn’t tell them there were zucchini in them. My secret. Delicious. I think these might be added to my tailgate parties. I tried these and they were good. Mine turned out to be more of a cake than brownies but the receipt was still good! I’ve been wanting to try a zucchini brownie recipe. I think I just found the one! These were so good… and perfect timing as I had leftover zucchini from my chicken noodle dinner last night! I hope these make it to the weekend…. but I seriously cant quit eating them! I’m glad you enjoyed them! They never last long at our house either. We loved the brownies, took some to work and the were gone in no time. Thank you for sharing your recipe. I don’t understand the reviews. I wasted time and energy on something I wanted to take to a special event and I’m so glad I tasted them first. SO bitter…did not even taste like a dessert. Coukd not even taste much chocolate flavour either. I literally had to throw them out. I used the 1/4 sugar as I don’t use stevia. Hi! It calls for 1 and 1/4 cup regular sugar. I’m so sorry they didn’t work out. I unfortunately had the same result. I also made them for an event and threw them in the bin. The texture was perfect, I had to bake for a little longer (maybe my zucchini’s had more liquid in them), they looked fabulous. BUT, they had absolutely no taste. I followed the recipe exactly. I chalk it up to perhaps we just have different palates and mine doesn’t work for this recipe. Wow! I’d never made zucchini baked goods before. I’m so happy I found this recipe! Holy Moley! I will make these weekly as the zucchini continues to roll in. I used EVOO, 1 cup of sugar and added an egg. I’m not vegan. This is a keeper recipe. Can not wait to try all the variation ideas. Kudos! Yay! I’m so glad you enjoyed it! and yes…it is fantastic with olive oil! We’ve been doing that too lately! Thanks for tip! This recipe turns out amazing! I literally threw everything together and mixed it and baked it. I substituted 1/2 cup flour for almond flour and it is still amazing. Thank you! Thanks for your comment! So good to know that it works with almond flour!!! Making the second batch of these in two days! First one fed to “old” men at work. Loved seeing their faces after I told them they were filled with zucchini and vegan! 🙂 Everyone loved them! So now making a batch for home. These are perfect for using up all the summer zucchini! Made my day!!! 🙂 So glad you’re enjoying them!!! Very dry and crumbly. Not fudgy at all. Not surprising as there I no liquid other than the zucchini. Don’t forget to add the oil!!! Can you make these with coconut flour? Hi! I’ve never made zucchini brownies with that substitution. You would need to use much less coconut flour. I believe the substitution is about 1/3 cup coconut to replace 1 cup of flour. Good luck and please write back if you give it a try! This recipe is an absolute keeper! 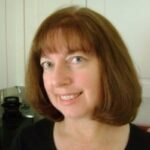 Thank you for sharing, Marjory. I do honestly believe the brownies were much better post refrigeration. These did not come out well for me. The sugar never completely dissolved and it was too sweet. It needs an egg or other moisture. The top still looked like a crumbled mess after baked. They were fudgy though. I’m so sorry that they didn’t work out for you! An egg can definitely be added to the recipe. However, it seems like something may have been off because we make without egg all the time without any issue. Perhaps too much zucchini?…Would be happy to help you troubleshoot if you decide to make it again.